Geospatially-oriented social media communications have emerged as a common information resource to support crisis management. The research presented compares the capabilities of two popular systems used to collect and visualize such information - Project Epic’s Tweak the Tweet (TtT) and Ushahidi. The research uses geospatially-oriented social media gathered by both projects during recent disasters to compare and contrast the frequency, content, and location components of contributed information to both systems. The authors compare how data was gathered and filtered, how spatial information was extracted and mapped, and the mechanisms by which the resulting synthesized information was shared with response and recovery organizations. In addition, the authors categorize the degree to which each platform in each disaster led to actions by first responders and emergency managers. Based on the results of the comparisons the authors identify key design considerations for future social media mapping tools to support crisis management. Crowd-sourced information has rapidly become an essential source of data in disaster response. Since the first well-documented efforts of citizen journalists on September 11th, 2001 and the use of internet blogs to collect information after the 2004 East Indian Ocean Tsunami, recent emergency response efforts have included mapping SMS messages after the Haiti earthquake in 2010. The Haiti earthquake represented a paradigm shift in the use of social media for disaster response, as multiple web-based platforms emerged to collect, refine, and disseminate crisis-related social media. The use of social media to gain real time information on the ground in a disaster has been driven by the rapid speed at which information can be distributed, the cross-platform accessibility of information, and the ubiquity of social media worldwide (Vieweg, Hughes, Starbird, & Palen, 2010). The utility of this information has been enhanced by the creation of crisis maps based on location data extracted from social media communications (Liu & Palen, 2010; MacEachren et al., 2011). In 2011 the American Red Cross conducted a survey that showed that 33% of citizens have used social media sites, including Facebook, Twitter, Flickr and SMS text messages/alerts to gain information about an emergency (American Red Cross, 2011). About half the respondents said they would contribute information during an emergency using social media channels. Statistics from the International Telecommunication Union reveal that in 2009 there were 4.6 billion mobile phone subscribers world-wide and 1.5 billion subscribers used mobile devices to access the internet (International Telecommunication Union, 2011). We can reasonably expect the use of social media in disaster response to increase in the future. 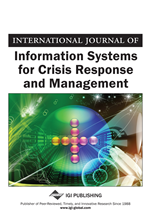 Research on the increasing use of social media in disaster response has emerged as a new focus in the field of crisis informatics (Anderson & Schram, 2011; Jennex, 2010). Extracting, categorizing, visualizing, and evaluating such information presents serious research challenges, including the problem of managing and extracting meaningful information from the large volume of contributions, applying the information to decision support workflows, and the development of formal information sharing protocols (Harvard Humanitarian Initiative, 2011). Recent work has focused on exploring the different roles social media sources may play among different types of crisis responders and decision makers (Lang, 2010; Reuter, Marx, & Pipek, 2012), and on the use of media gathered from recent disasters to characterize the utility of such information in crisis situations (Jennex, 2012). Mapping crowd sourced information in disaster response gained wide-scale media attention after the successful deployment of the Ushahidi Crisis Map during the 2010 Haiti earthquake (Starbird, 2011). There are a number of specific challenges involved in mapping social media communications, including the extraction of accurate location information, and the application of useful and usable cartographic representations to visually support situational awareness in crises. Research on the integration of Geographic Information Systems (GIS) and crowdsourced information from social media has focused more on the challenges of extracting action items and location information from social media feeds (MacEachren, et al., 2011) and less on the utility of the extracted information and the effectiveness of associated crisis maps to support emergency response.